The Mitty this year was a really big event. There were 74 cars in Group 5, also known as Historic Production. 65 of the entries were genuine door slammer historic production cars. 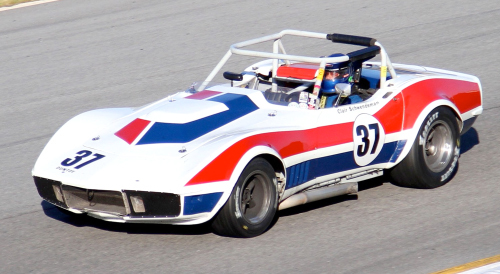 As if the field wasn’t large enough already, HSR saw fit to add 9 sports racing cars including McLarens, Lola T70’s, Chevrons and Swifts. According to an interview posted on the HSR website, the T70’s have 610 HP and weigh 1500 Lbs. Obviously they have vastly superior aero than a vintage Corvette or Mustang, but that’s not all. The Lolas and McLarens all run Avon racing tires. According to the HSR rulebook, the door slammers are supposed to run either Hoosiers or Goodyears. So much for a level playing field! So much for giving historic production cars a shot at the podium in their own race. Not all the door slammers ran Hoosiers or Goodyears. The 2011 points leader in Group 5 was also on Avons in his GT40. Avons were on three of the top four qualifiers in Group 5. Needless to say, the fix was in, and after qualifying a McLaren and a Lola T70 on Avons made up the front row. Tires were not our biggest issue this weekend. We were implementing the last batch of Tony’s magic pieces. But that wasn’t our biggest problem either. We had just overhauled our engine and got it back in the car a few hours before our truck was to leave for Atlanta. We loaded it at night, and the low oil pressure light was on. The engine had made normal oil pressure on the dyno, so we just figured we would deal with it when we got to the track. We dealt with it all weekend. We run Torco oil, which turned out to be our salvation. We never had over 25 lbs of oil pressure, and that pressure was there only at high RPM’s. The engine made about 5 lbs at idle. We discussed putting the car back in the trailer after every session, but we made every session and kept pushing our luck. Needless to say, we tried everything. Every session we tested something, but nothing made any difference. We adjusted the oil pump, replaced the oil pump, bled the gauge, replaced the gauge, and we twice changed the place on the engine where we picked up the oil pressure. Before the feature race we finally read the oil pressure out of the pump itself, without sending it through the engine. Now that was some oil pressure! Since it was the Mitty, and the engine had run all weekend, in a split decision we decided to run the race. We won the race. The two Avon shod sports racers broke during the enduro, so the third fastest car won the race. Clair’s engine went off song early in the feature race, the result of a broken rocker arm, but he still soldiered on to finish 11th. During the enduro, Clair’s car had an unscheduled pit stop to replace a valve cover gasket. That ended our string of GT1 enduro class wins, but he soldiered on anyway and finished the race 5th in class. The Classic GT enduro was won by a 1970 Chevron, followed by two 1985 Swifts. So much for Classic GT. HSR apparently doesn’t care all that much for the large group of Classic GT production cars that support their events. Apparently the message is, ‘if you want to win one of our big bore production races, get a Lola, a McLaren, a Chevron or a Swift’. 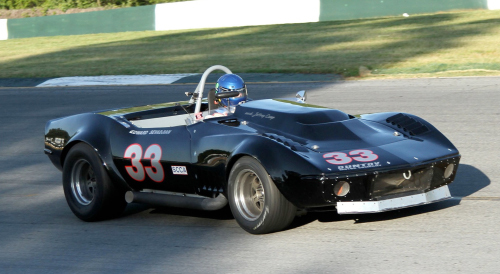 At the Mitty this year, Corvettes and Mustangs were relegated to field fillers. It didn’t seem to please them that a field-filler won the race. Bottom line, in spite of it all, we managed a win. We haven’t yet cashed in on the new car’s promise, but it was good enough this weekend for the top spot on the podium of a very big race. By the way, when we got home we tore the engine apart and found the problem. We had spun a cam bearing, so we had to undergo another engine overhaul.